The drive for more efficient and durable gas turbines has resulted in smaller, lighter designs capable of withstanding heavy loads and extreme operating temperatures. These conditions pose a great challenge to designers tasked to meet demanding durability goals. Higher turbine flow temperatures lead to higher efficiency, but can cause structural problems for the turbine blades so cooling techniques are used to keep blade temperatures under control. The design practices typically employed in industry for cooled turbine airfoils are largely empirical and can easily miss important physical behaviors impacting durability. Predictive methods tend to be loosely coupled, based on simplified 2D aerodynamic approximations and data correlation, and often require the execution of multiple codes that can lower accuracy and increase the potential for execution error. Much research effort has been devoted in recent years to conjugate heat transfer analysis as the means to better predict metal temperature of turbine parts. 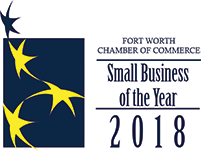 This approach provides two key advantages. The first is a better understanding of the flow around film cooling holes and its effect on both metal temperature and heat transfer on the film holes and endwalls. The second is a simpler, more streamlined process for durability analysis during the design cycle. In previous work [Reference 1], a conjugate heat analysis was conducted on the first vane row of the Air Force Research Laboratory's (AFRL) High-Impact Technology Research Turbine (HIT RT). 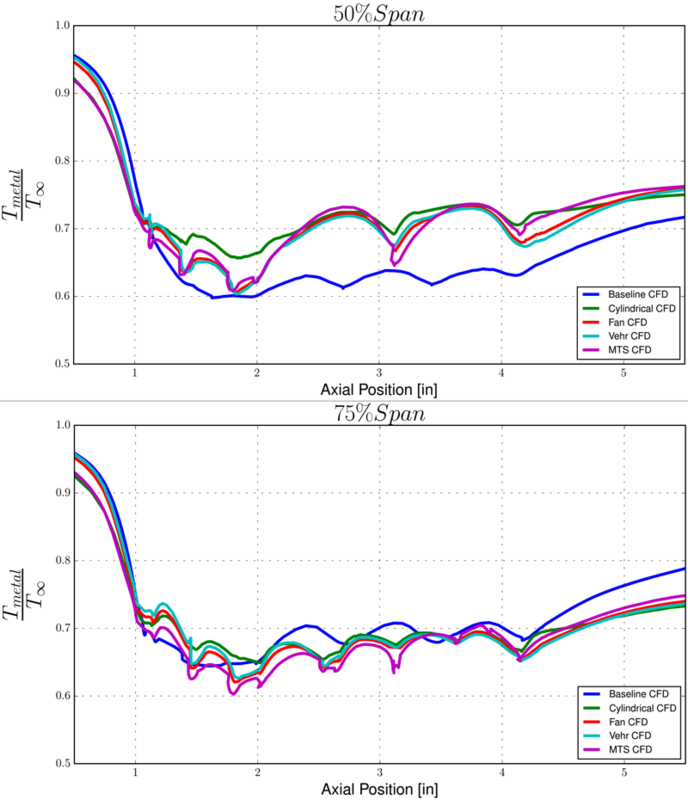 The predictions were compared to experimental data and showed good agreement (+/- 5K) with measurements in both surface metal temperature and heat flux. Figure 1: Surface metal temperature distributions for the HITRT 1st vane row, above, and the Pointwise generated mesh, below. Additional work has since been done [Reference 2] to optimize the pressure side cooling flow pattern using a genetic algorithm in order to reduce an excess of coolant at the airfoil midspan and to mitigate hotspots near the outer diameter (OD) endwall platform without increasing the coolant mass flow rate through the vane. A flat plate model was used as an analogue for the pressure side of the vane in order to facilitate collection of experimental data. Figure 2: Baseline film-cooling pattern, left, and optimized film-cooling pattern. The optimized cooling pattern acts to move excess cooling flow away from the midspan region of the airfoil and redistribute it toward the OD platform to help with secondary flow induced hotspots. In addition to the optimized cooling pattern, four different cooling hole geometries were examined to determine their effects on the film-cooling effectiveness when used with the optimized cooling pattern. The four hole geometries, shown in Figure 3, are cylindrical, fan-shaped, Vehr, and mini-trench shaped (MTS). Figure 3: Four types of film-cooling hole geometries: (a) cylindrical, (b) fan-shaped, (c) Vehr, (d) mini-trench shaped [MTS]. 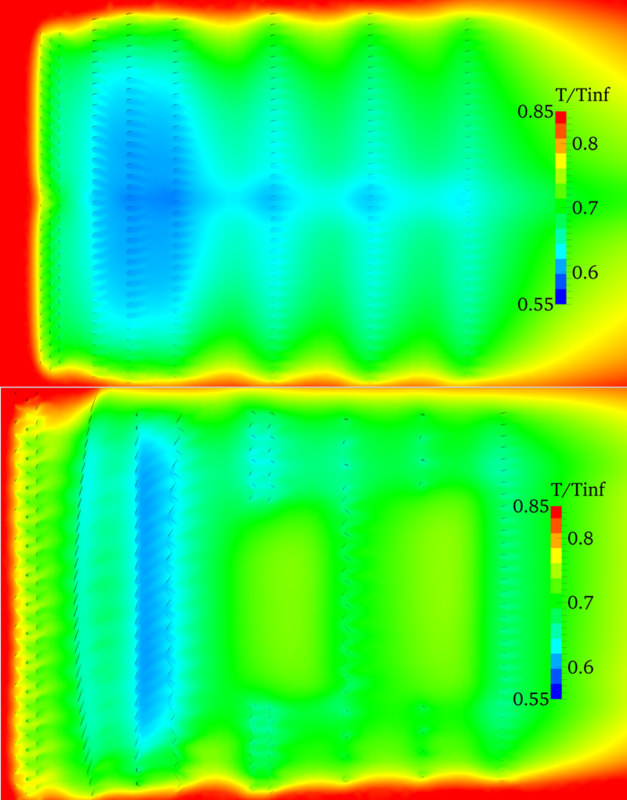 The flow simulations of the film-cooled flat plates were conducted using Code Leo, a three-dimensional unsteady Reynolds-averaged Navier-Stokes solver, using the conjugate heat transfer method. 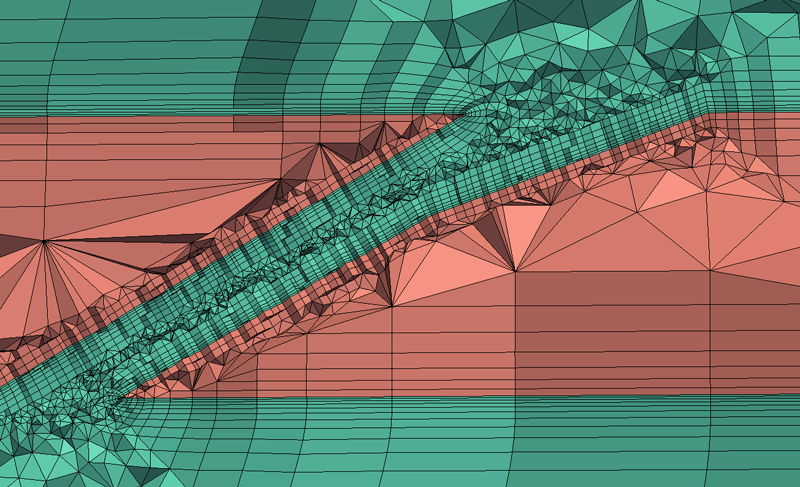 An unstructured meshing approach was selected for the initial calculations due to the difficulty of generating a structured mesh for such a complicated geometry. Pointwise's T-Rex technique was used to create layers of prismatic cells in the boundary layer for increased accuracy while still keeping meshing times reasonable. The mesh was generated for both fluid and solid domains based on mesh sizing parameters determined by a mesh sensitivity study conducted previously for the baseline cooling configuration. The height of the first point away from the wall in the fluid was chosen such that y+ ≈ 10. 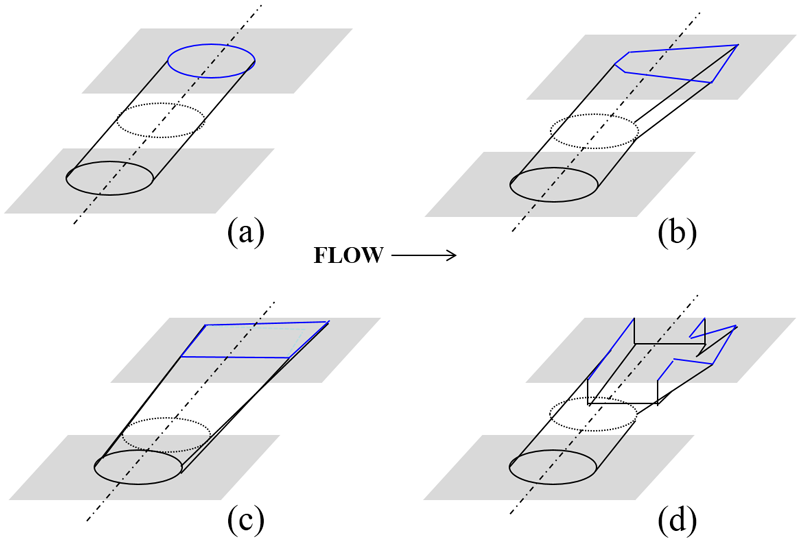 The meshes had a point-to-point match on the interface between the fluid and solid domains, as shown in Figure 4, to eliminate error due to interpolation. The meshes contained an average of twelve million elements for the fluid and solid domains combined. Figure 4: Cross sectional view of fluid (green) and solid (red) mesh through a film-cooling hole. 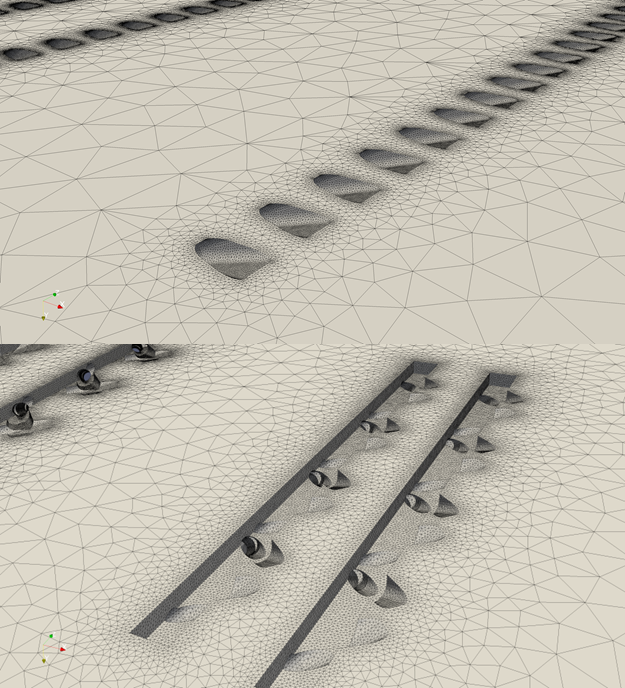 Initial results showed the mini-trench shaped (MTS) holes performing differently from all other optimized configurations, so another mesh study was conducted to determine if the original meshing parameters were still valid for the optimized geometries. Figure 5 shows the surface temperature distribution at midspan for the baseline configuration on both an initial mesh based on the previously determined mesh parameters as well as a refined mesh. The results show some minor differences near the edges of the plate, but very little change in the film-cooled region. Similar results were seen for the other film-cooling configurations except the MTS case. The refined meshes had an average of 28 million elements for the fluid and solid combined. 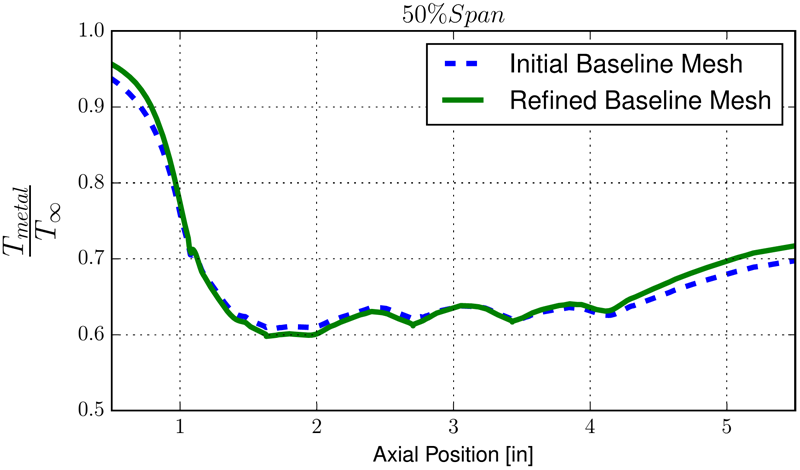 Figure 5: Mesh study results for baseline configuration. Figure 6: Mesh study results for MTS configuration. In Figure 6, a similar result is shown for the MTS hole configuration. Here, a large difference due to the mesh resolution can be seen. The change in mesh results in a large decrease in surface temperature, bringing the results in line with the other optimized configurations. This suggests that there is some feature present only in the MTS configuration that was not accounted for in the original mesh study. Figure 7: Close up of baseline film-cooling holes, above, and MTS film-cooling holes. As can be seen in Figure 7, the MTS configuration, below, has many small flat surfaces due to the trenches inherent in the film-cooling hole geometry. Some of the mesh sizing parameters selected from the previous mesh study were based on local surface curvature, due to the nature of the cooling hole geometry used in the baseline case. In the case of the MTS configuration, the small flat surfaces were being meshed far too coarsely since the curvature based mesh sizing cannot determine an appropriate mesh spacing for this type of geometry. In the refined meshes, a local maximum element size was specified to avoid this problem. Figure 8: View of surface temperatures for baseline, above, and optimized film-cooling patterns. Figure 8 shows the difference in the non-dimensionalized surface temperature distributions between the baseline, above, and optimized cooling patterns. As mentioned earlier, the baseline configurations have a buildup of cooling flow along the centerline due to the orientation of the first few rows of film-cooling holes as well as a lack of cooling flow towards the OD, shown at the top of the plot, which resulted in the hot spots on the 3-D vane. In the optimized cooling pattern, the upstream film-cooling holes have been modified to move cooling flow away from the center and bias it towards the OD to help alleviate the hotspots. Figure 9: Surface temperature distributions for all cases at midspan, above, and near the OD platform. Finally, Figure 9 compares the surface temperature distributions for all cases at both midspan, above, and near the OD platform. 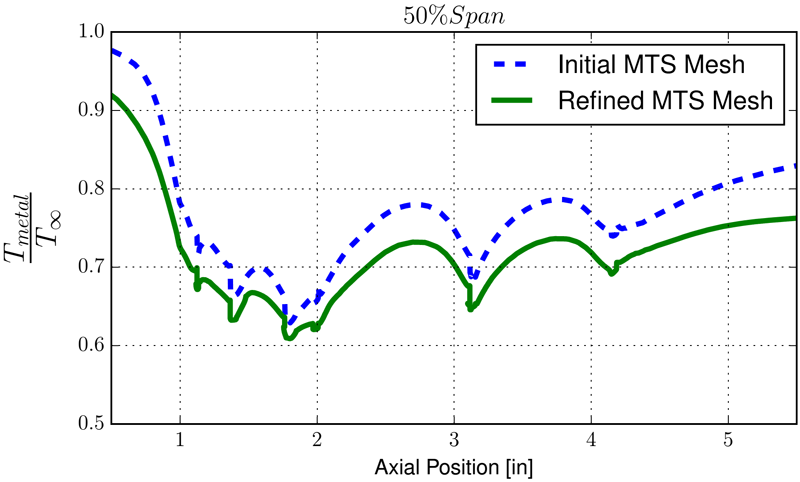 At midspan the baseline cooling pattern (blue) shows the lowest non-dimensionalized surface temperature, which is expected due to the build up of cooling flow discussed earlier while the optimized cooling patterns have moved cooling flow away from the center resulting in higher temperatures there. 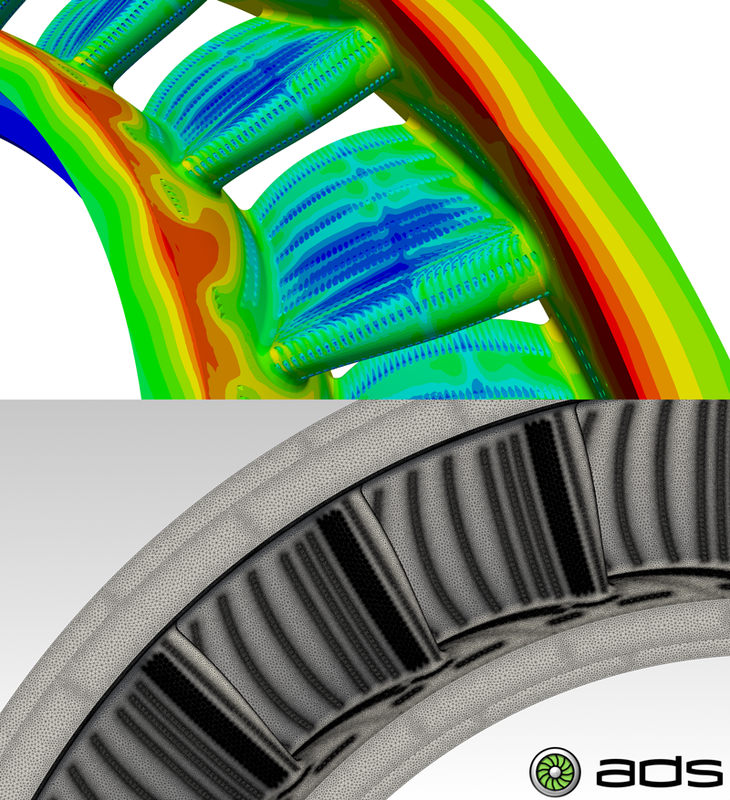 Near the OD, however, the situation is reversed and the optimized cooling pattern shows a lower surface temperature for all cases relative to the baseline pattern, showing that the goal of the optimization was successfully achieved. In addition, the effect of the various film-cooling holes geometries was found to be small relative to the effect of the different film-cooling patterns, but the MTS configuration was found to have the best cooling effectiveness for a given coolant flow rate. Ni, R.-H., Humber, W., Fan, G., Clark, J. P., Anthony, R. J., and Johnson, J. J., 2013. “Comparison of predictions from conjugate heat transfer analysis of a filmcooled turbine vane to experimental data.” In ASME Turbo Expo 2013: Turbine Technical Conference and Exposition, Vol. GT2013-94716, American Society of Mechanical Engineers, pp. V03BT11A013–V03BT11A013. Johnson, J., King, P., Clark, J., and Ooten, M., 2012. “Genetic algorithm optimization of an hpt vane pressure side film cooling array.” In ASME Turbo Expo 2012: Turbine Technical Conference and Exposition, Vol. GT2012-68049, American Society of Mechanical Engineers, pp. 1151–1161. If you would like to generate your meshes using Pointwise request a free evaluation today.